Mayor Bloomberg might not have noticed, but this week the Australian trumpeter Bob Barnard made Manhattan his own. Bob and his very charming wife Danielle have been away from home for nearly two months now, with visits to Scotland and England, to Jazz at Chautauqua, touching down for their final fortnight on the East Side. When I heard from Bob (at Chautauqua) that he was planning to visit some New York jazz spots, I put on my Carpe Diem outfit (it has a lapel button reading I’LL SLEEP NEXT WEEK) and followed him around admiringly. Bob knows the repertoire masterfully but isn’t offering a series of pre-formulated solos. Rather, he approaches each chorus as a leap into the unknown: what will this melody and chord sequence have to say to me? And his improvisations have lovely tumbling phrases, a round glowing tone, an exuberance that elates both audiences and musicians. I hear Louis and Bobby and Bix, but you’re never in doubt that it’s Mr. Barnard at the helm. Last Tuesday, September 21, Bob and Danielle came to Club Cache in the Hotel Edison for an evening with Vince Giordano and the Nighthawks. For most of the night, Bob was enjoying the band: their authenticity, their playfulness, their swing. 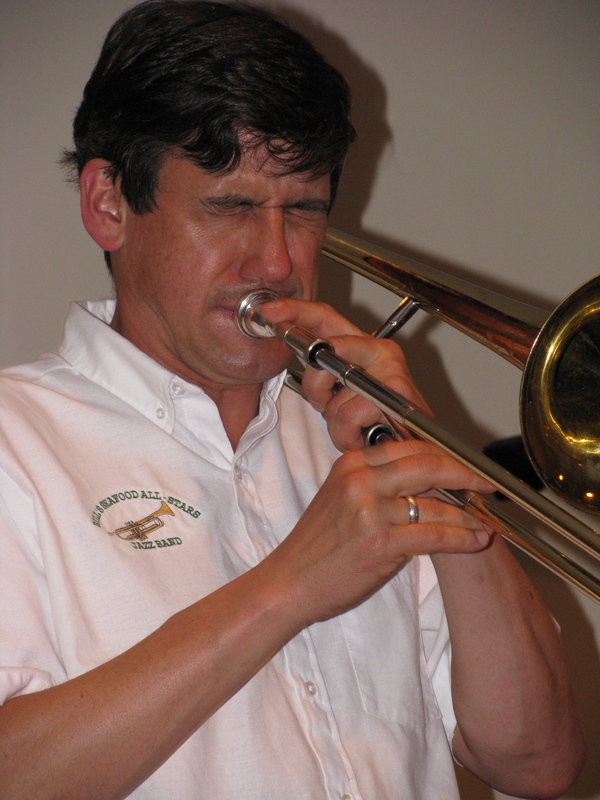 This edition of the Nighthawks included Jon-Erik Kellso and Mike Ponella, trumpets; Jim Fryer, trombone; Will Anderson, Pete Anderson, and Dan Levinson, reeds; Andy Stein, violin and baritone sax; Conal Fowkes, piano; Ken Salvo, banjo and guitar; Vince, bass sax, string bass, tuba, and vocals; Arnie Kinsella, drums. Vince invited Bob up for three solo features, one more gratifying than the next. There’s more to come from Bob in New York!